I started this document to get an insight in the structure/architecture of the PCB program. The main objective is to get up to speed so we are able to start contributing to the PCB program. You must have a working build system before you even can think about hacking the source code. Make sure you can build a git clone. Try building the sources from git before you try anything else. The wiki page http://wiki.geda-project.org/geda:developer shows the git command to get the geda-gaf repository. We are talking about pcb here. While working on the pcb sources remember that PCB uses The AutoTools as there build system. This isn't as daunting as it sounds, for the newbie developer. The PCB development team has made it easy for us. The autogen.sh script is usually only needed once, after a git clone or if a file is added to be build into PCB. See Example on when to use the autogen.sh script. Here is a short introduction where to start if you want to trace an action down into the source code: Lets draw a line in the (GTK) GUI. If we start pcb the default mode is the select mode, in order to draw a trace we need to switch to the LINE mode. We do that by pressing F2. Next we use the mouse to select a starting point and do a left click of the mouse button. Now we can start drawing a trace. So what happens in the source code? PCB uses a flexible way of implementing menu structures and it uses a flexible way to implement actions the program should do. All this flexibility made it a bit difficult for me to see where to start. First let's trace the LINE mode selecting by pressing F2. The action_action_list defines that the Mode event is translated into the ActionMode function. So the function called when we press F2 is ActionMode(Line). 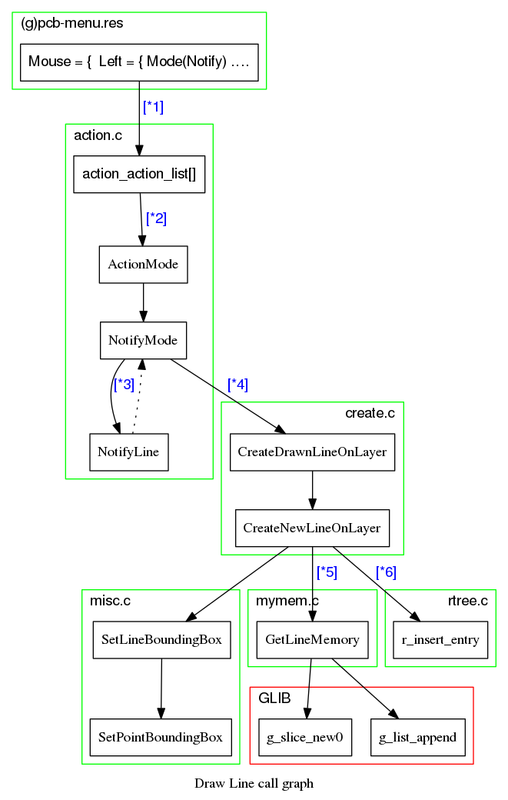 ActionMode is a generic function and therefore it will need to find what to do. Next we trace down what will happen if we left click the mouse button to start drawing a track. Please note this is a very simplified call graph. [*3] The program will go back and forth between NotifyMode and NotifyLine until [*4]. In the function NotifyLine all the dynamic processing is done, meaning that here the limitations and restrictions are check realtime. e.g. if the Auto force DRC check flag is checked, this function checks if we try to draw over existing copper. [*5] We need to free memory-space and add our new Line into the linked list. This is done through the GLIB Library. Next our newly created LINE object is filled with the relevant data. Basically we are done, the line is added to the data structure. However there is one more thing to do. [*6] Our new line is stored into the main PCBType data structure (actually in the DataType sub structure). Now there is one more administrative task to do, the newly created line must be add to the rtree data structure. Every item that is added to the data structure is also added to the rtree data structure. The R-TREE data structure makes it easy to search for free or occupied areas on a layer. This is in a very simplified description on what happens and the path the software takes to draw a line. This is the actual location on the board which is used when you perform an action. If grid snap is active, the crosshair reflects the grid point closest to the cursor, else the crosshair reflects the cursor itself. So the crosshair is the X Y position on the PCB canvas. When grid is enabled the crosshair is automatically snapped to the grid. Open the file crosshair.c with your favourite text editor and look for the function FitCrosshairIntoGrid. In my version its around line 920. In your terminal you will see the X and Y coordinates of the crosshair. Please note that they are rounded numbers. Turn off grid snapping and watch the numbers. As an exercise let's do something easy, like adding an action to PCB. Before you start coding take a look at: Build system It is essential that you have a working build system. When working on the source code of PCB then please make use of lots and lots of comments (preferably doxygen style). In trying to understand the code I was very grateful for every piece of comment the developer had written. *  Example action implementation for PCB. 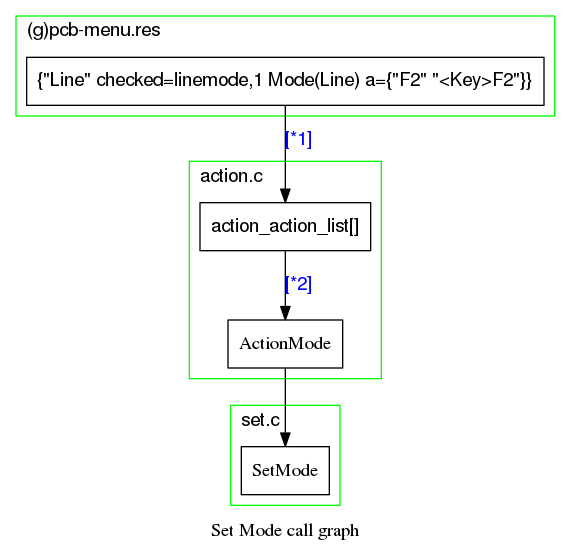 *  \Brief:  Example on how to implement a action in the PCB program. This function doesn't do anything useful. For an explanation on the REGISTER_ACTION macro see paragraph REGISTER. Next we need to add our file to the build system. We do that in the file MakeFile.am. Open MakeFile.am and look for the variable PCB_SRCS and add the file example.c there like the others. In the PCB program type “:DoSilly()” and watch the message log window. During the build process the files core_lists.h and gtk_lists.h are created. These files contain nothing more than a collection of REGISTER_* instructions it found in its source files. And therefore it will call all functions to register the actions at the beginning of the main function. REGISTER_ACTIONS These actions can be called though the user command window (start with “:” in the PCB program. REGISTER_FLAGS These flags initiate a functions when set or unset. The “grid” flags is associated with the menu flag: View→enable visible grid and makes the connection to the FlagGrid() function. If you select View→enable visible grid the function FlagGrid will be called. The main_attribute_list defines the command-line options. Most of the HID also use this macro, to add their command line options as well. The DataType contains the actual data that defines our printed circuit board. DataType is what's stored in the Buffers when you do cut/paste. The actual data is stored in the GList data elements. The rest is there for administrative purposes, to keep track of it all. Here I like to specially mention the rtree_t* data members. Although they have an administrative character the R-TREE data structure is heavily used in the PCB program. gpointer data holds the element's data , which can be a pointer to any kind of data. From Wikipedia: The key idea of the r-tree data structure is to group nearby objects and represent them with their minimum bounding rectangle in the next higher level of the tree; the “R” in R-tree is for rectangle. 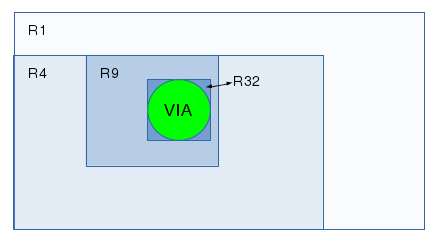 Since all objects lie within this bounding rectangle, a query that does not intersect the bounding rectangle also cannot intersect any of the contained objects. At the leaf level, each rectangle describes a single object; at higher levels the aggregation of an increasing number of objects. This can also be seen as an increasingly coarse approximation of the data set. The bottom row of records are called leafs. The r-tree data structure hold a copy of the where's what data. Meaning that it holds a list of every item on our canvas arranged in successively smaller boxes.